Families entering the shelter system in 2012 differ from those in years prior in a very important way – most of them have been homeless before. In 2005 and the years prior, the percentage of families entering shelter who had previously been homeless remained relatively constant at 25 percent. 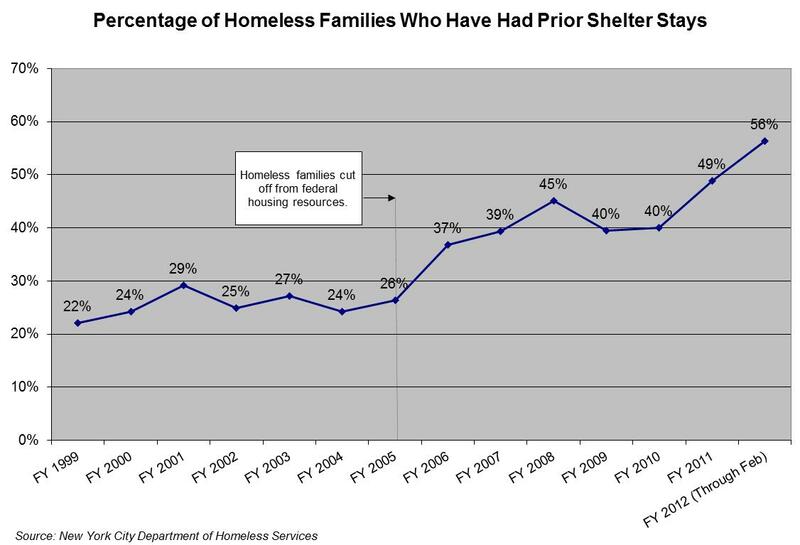 So far in fiscal year 2012, over 56 percent of all families entering shelter have been homeless before, an increase of 7 percentage points over last year and 16 percentage points over 2010. This shocking upward trend in repeat families stems from a 2005 policy decision of the Bloomberg administration that cut off homeless families from receiving federal housing resources, such as public housing and Section 8. Instead, the City replaced these successful permanent housing programs with a series of time-limited rental subsidies, the latest of which was Advantage. This disastrous policy has created a revolving door in and out of the shelter system for thousands of families and is also contributing to current record homelessness. Sign our petition asking the Mayor to once again allow homeless families to access permanent housing resources!